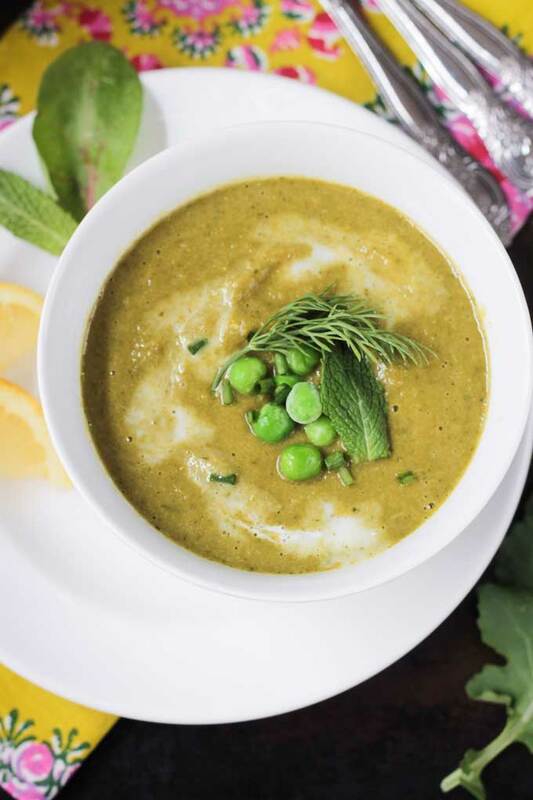 Cold Cucumber Soup – a cool and creamy, dairy free soup that’s perfect for summer. And it’s all made easily in a blender. The kids might be going back to school this week, but we’ve got plenty of hot summer days ahead. Easy recipes to cool us down are still a must. This Easy Watermelon Blender Juice is a favorite, as is this Tart Cherry Sparkling Lemonade. As far as dinners go, we’ve been enjoying lots of this cucumber quinoa salad and these 15 minute burgers. 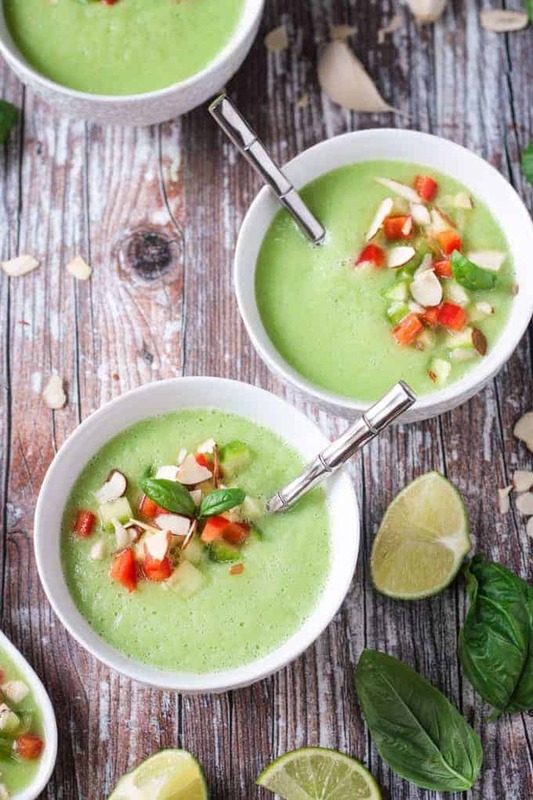 One of my favorites to reach for at lunchtime is this cool and creamy Cold Cucumber Soup. It’s so light and fresh – perfect for using up all of those garden cucumbers. It’s an excellent starter for a heartier meal, too. Cucumbers are often overlooked when discussing the most nutrient dense vegetables. Technically they are classified as a fruit, though most would refer to them as a vegetable for culinary purposes. And although they might not boast quite as many nutrients as their cruciferous buddies, cucumbers are still full of health promoting goodness. You’ll find vitamin K, vitamin C, potassium, magnesium, vitamin B1, and fiber in these slender green beauties. They are also rich in antioxidants. Because cucumbers are made up of mostly water, they are low in calories and fat, and are extremely hydrating. This makes cucumbers a potentially great choice for weight loss. Sliced cucumber rounds make great appetizers with your favorite dip – like my Cucumber Bites with Sun Dried Tomato Spread. Cucumbers can even be good for your skin. 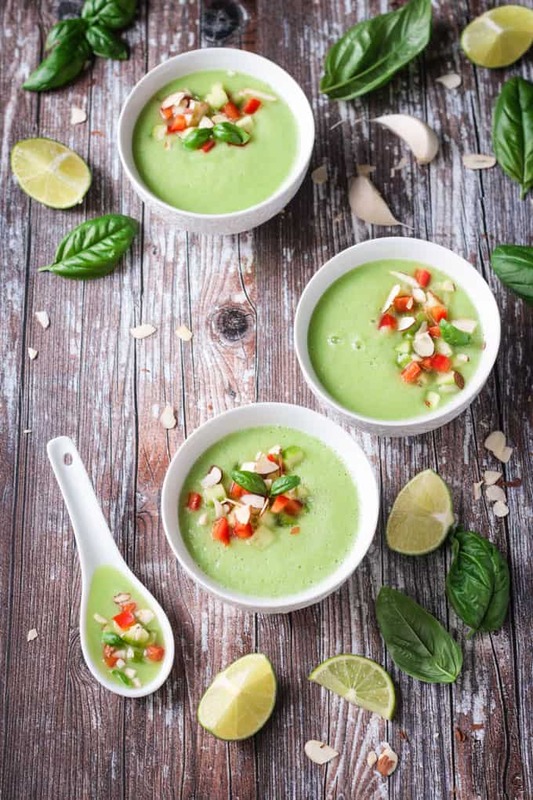 Not only can eating healthy fruits and vegetables, like this Cold Cucumber Soup, make your skin glow, but sliced cucumbers on your closed eyelids may help to reduce puffiness and swelling. Cucumbers contain cucurbitacins, which are organic compounds naturally produced by the plant, and can cause a bitter taste. Generally, the cucumbers you find in your local grocery store won’t have much bitterness as they are purposely grown and selected to taste their best. But garden cucumbers, if not grown in perfect conditions, can definitely have a slight bitterness. The bitterness, if any, will be mostly found on the skin and stem end of the cucumber. Slicing off the ends and then peeling the skin from flower end to stem end should take care of removing any bitterness. You could even go one step further and rinse your peeler after every swipe to make sure you aren’t dragging that bitterness from the stem end back onto the vegetable. 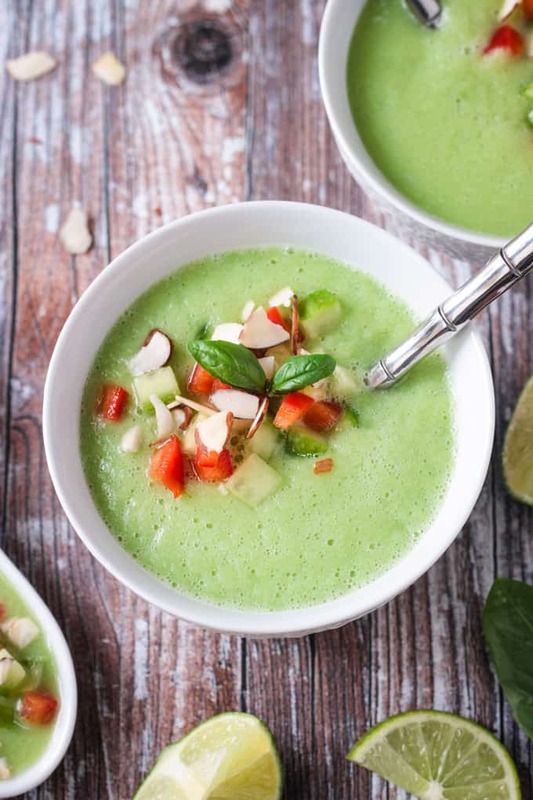 For this cold cucumber soup recipe, I added a sweet apple to help balance the tart lime and herby basil. It also helps to counteract any bitterness that the cucumbers might have. We are also removing the seeds of the cucumber to ensure it blends perfectly! I like to use seedless English Cucumbers. They aren’t actually seedless, but the seeds are smaller and more tender than a lot of other varieties. There are also fewer of the seeds in each vegetable, leaving more of the cucumber flesh to enjoy. Though, your average garden cucumber works perfectly, too! 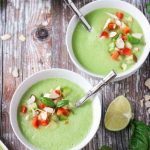 Like I said, summer is meant for quick and easy recipes, and this Cold Cucumber Soup recipe ticks that box. It’s made fully in a blender in just a few short minutes. Personally, I love to use my high speed Vitamix blender, but an immersion blender in a soup pot or large mixing bowl, or a food processor would work as well. If you don’t have a well working blender and your soup doesn’t get perfectly smooth, try running it through a fine mesh sieve before serving. 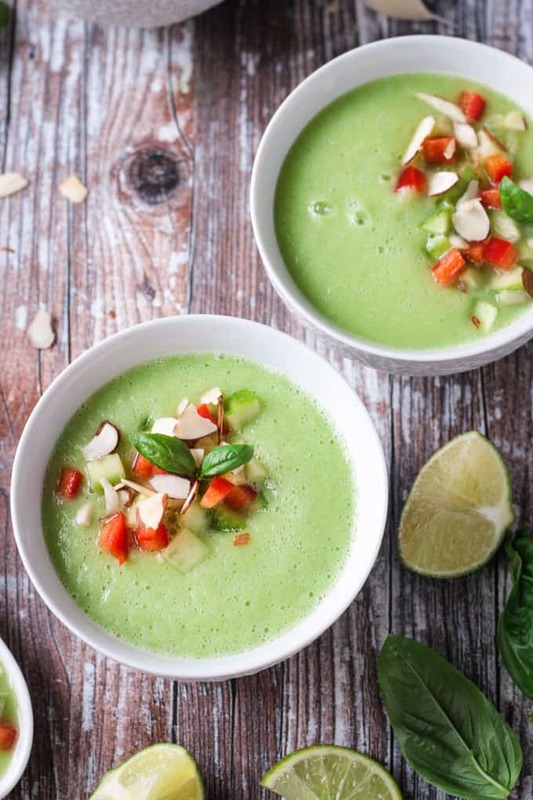 This chilled soup couldn’t be easier to make. Just chop all of your ingredients and add them to the blender. Carefully transfer the blended soup to an airtight container and stick in the fridge for an hour or two to chill. You could certainly eat it right away, if you wish, but I prefer it definitely on the chilled side. I like to garnish this Cold Cucumber Soup with diced red pepper, slivered almonds, and of course, more diced cucumber. The red pepper and almond inspiration came from a local farm to table restaurant in a suburb of Minneapolis that now escapes my mind. We stopped in for lunch during the summer of 2017 while on vacation and I ordered their Chilled Cucumber Soup, which came with garnishes of diced red peppers and almonds. It’s taken me over a year, but I finally recreated that dreamy deliciousness! I hope you love this Cold Cucumber Soup as much as I do. If you try it, please come back and leave me a comment below with your feedback and star rating. 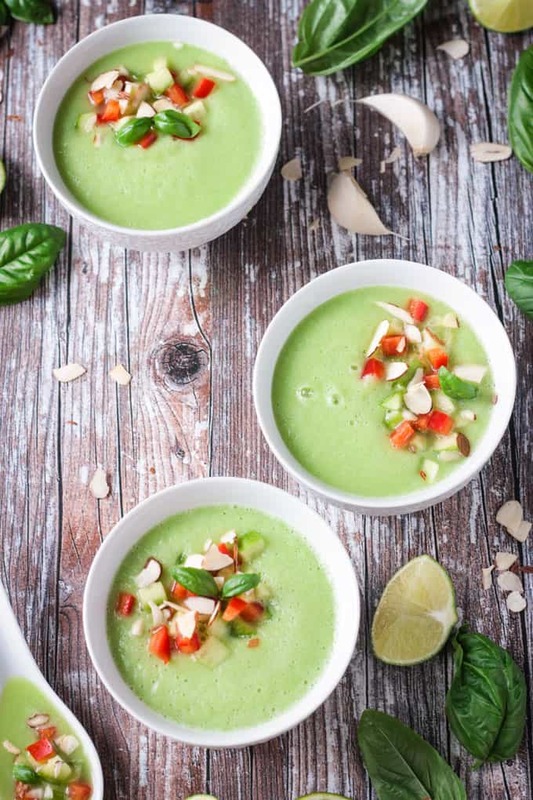 Cold Cucumber Soup - a cool and creamy, dairy free soup that's perfect for summer. And it's all made easily in a blender. Place all of the soup ingredients into a high speed blender and purée until smooth. Add water (or additional almond milk) to thin, if needed. Carefully transfer to an airtight container and place in the fridge for 1-2 hours to chill. Once chilled, serve garnished with diced cucumber, red peppers, and silvered almonds. This sounds really good. I love the sweetness added from the apple and the basil really sounds like it elevates the whole dish! Yum! I love the apple in there too. Perfect natural sweetness. Thanks, Jenni! I am definitely looking forward to fall! We love Cucumbers in my house and this looks delicious and like a great lunch idea. Plus a great way to use up those cucumbers from the garden! My kids brought in about 15 cucumbers the other day in one haul. Good thing they love ’em too! I make a cold cucumber soup too and it’s wonderful for a hot summer day. This looks so refreshing! Thanks, Lisa. I’ll have to check yours out too. 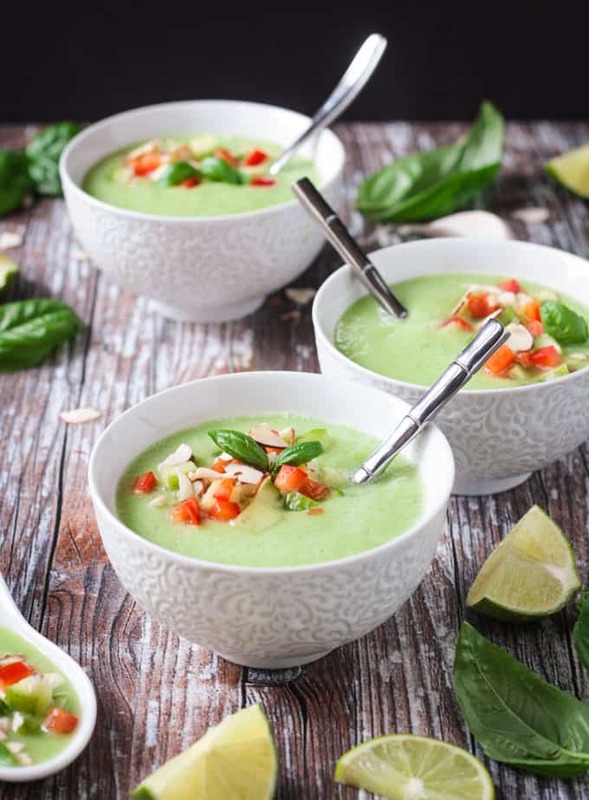 I can just imagine how refreshing and delicious this cucumber soup is! 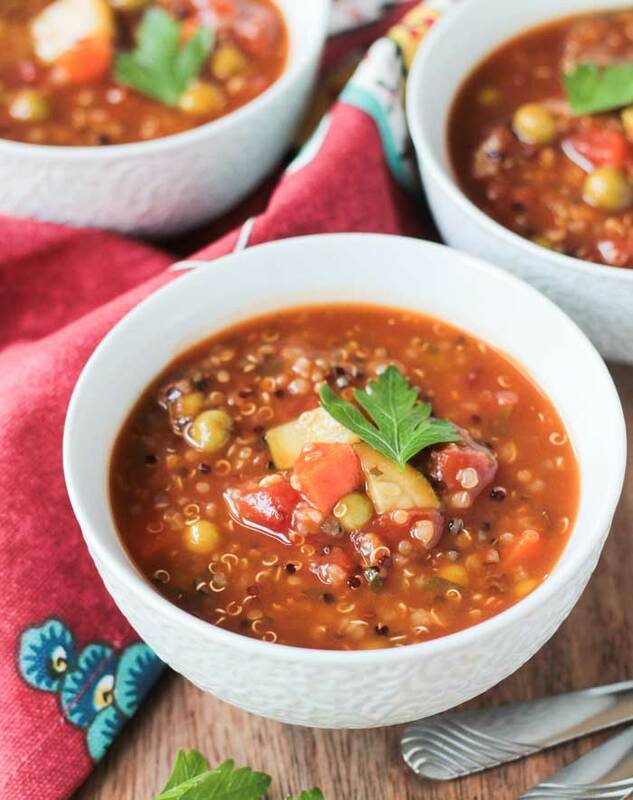 I love a good cold soup, but I also love hot soup even in the heart of summer! 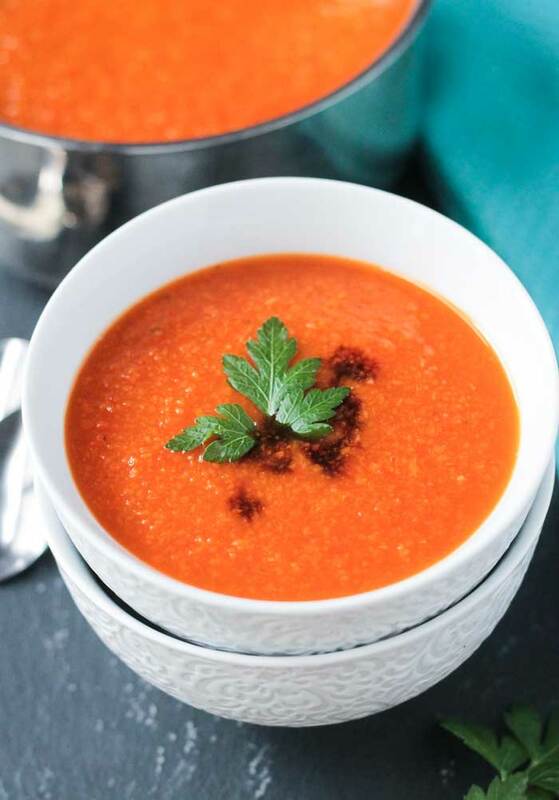 I’ll be trying your vibrant and delicious soup before the summers end for sure! Oh, me too, Elaine. I could hot soup all year round, but every once in awhile I like to mix it up. Thanks!